The Washington metro region's share of walk, bike and transit trips went up for almost all age groups between 1994 and 2007/08. Chart source: MWCOG TPB, Robert Griffiths. The D.C. area’s young population is traveling less, older residents are traveling more, and more people are taking transit and walking. That was the message at yesterday’s Transportation Planning Board (TPB) meeting. The TPB is the federally designated Metropolitan Planning Organization (MPO) for the D.C. area and serves as the regional forum for transportation planning. It is associated with the Metropolitan Washington Council of Governments (MWCOG). Robert Griffiths, the TPB’s Technical Services Director, presented the changes in regional travel behavior revealed by the recently analyzed 2007/2008 household travel survey. Since the previous travel survey in 1994, transportation patterns in the Washington metro area have evolved significantly. One key change driving new transportation trends is the increase in single-person households. This happened in D.C. proper and outer jurisdictions, such as Loudon and Prince William counties. The economic growth since the 1990s has brought more employment opportunities that have attracted a younger population. This demographic change will have a significant impact on regional travel patterns. Households with four or more members make up to 15 trips per day, while single-person households may only make four trips per day. As a result, our metro area has already seen a 7% reduction in the per-household trip rate since 1994. Travel changes by age group are also interesting. The health and wealth of the 65-and-over population means they are making more daily trips, in contrast to the traditional assumption that an aging population travels less. The 16 to 24 age group experienced a huge drop in their social recreation trip rate – almost by one half. Mr. Griffiths guessed that this might be due to the substitution of online social networking for in-person interaction. Additionally, this demographic’s school trips increased while their work trips went down, as people are now staying in school longer. As for mode shifts, auto trips dropped for people aged 16 to 34 and 55 to 64. 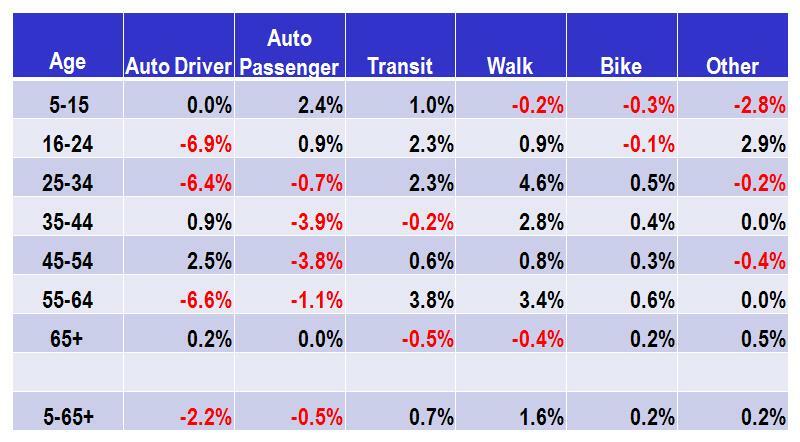 The latter group increased their use of transit and non-motorized modes. For all age ranges, there was a significant uptick in the number of walk and transit trips. The survey also analyzed land use patterns that affect transportation. Analysts found that the 25 to 34 age range is the most likely to live in regional activity centers, areas that tend to be more compact, walkable and transit-friendly. Also at the TPB meeting, David Robertson, the Executive Director of the MWCOG, led a discussion of how our metro region can take advantage of the U.S. Department of Housing and Urban Development’s new Sustainable Communities Planning Grant program. The program is currently out for public comment, and should be finalized this spring. A total of $150 million will be available, but the most a large metropolitan area could receive is $5 million. Applications for funding will be divided into three categories. Category 1, called “Regional Plans for Sustainable Development,” is for areas that are in the early stages of developing a sustainable development agenda. Category 2, “Detailed Execution Plans and Programs,” is targeted at regions that have moved to the next step of developing sector plans, etc. Category 3, “Implementation Incentives,” is for areas with fully developed plans that are ready to roll with bricks-and-mortar-type projects. Since D.C. is ready to prepare and adopt detailed plans, it may be a good fit for Category 2. Mr. Robertson stressed that the grant program’s principles of regionalism, inter-agency coordination, livability, and empowering local jurisdictions track closely with the MWCOG’s values. The D.C. region should be well-positioned to apply for funding because of its prior visioning work, specifically its development of Greater Washington 2050. In the coming months, a task force will be created to oversee the preparation of the application, following a process similar to the writing of the TIGER grant. Applications are due to HUD in June, and the announcement of awardees is expected in August.